We’d love your help. 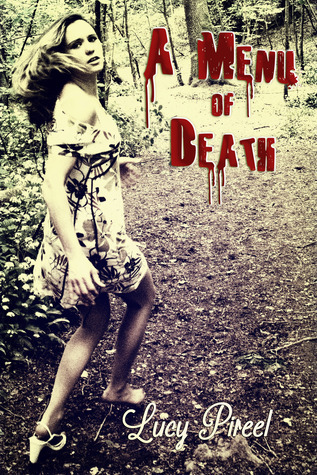 Let us know what’s wrong with this preview of A Menu of Death by Lucy Pireel. To ask other readers questions about A Menu of Death, please sign up. “A Menu of Death” by Lucy Pireel is a selection of very strong short stories, all written with a raw, edgy and bloody pen. Ranging from harsh reality to fantasy territory they provoke, open your mind, change your perspective, entertain and take you to the edge of your seat. They can be gory and violent yet also thoughtful and insightful; they are most certainly unpredictable and therefore a truly compelling read. Excellently written, tightly edited and brilliantly compiled into a varied yet homo “A Menu of Death” by Lucy Pireel is a selection of very strong short stories, all written with a raw, edgy and bloody pen. Ranging from harsh reality to fantasy territory they provoke, open your mind, change your perspective, entertain and take you to the edge of your seat. They can be gory and violent yet also thoughtful and insightful; they are most certainly unpredictable and therefore a truly compelling read. Excellently written, tightly edited and brilliantly compiled into a varied yet homogenous collection the pages just flick through your fingers. Contrary to a popular belief among my friends, Horror is not my favourite genre. I am curious about vampires and werewolves, and their interpretations. Mostly, I am interested in the characters and how they develop. In horror short stories, there isn't always room for character development, so these writings are likely to be more focused on action/s and its/their consequences. In 'A Menu of Death' Lucy Pireel's offerings are diverse and dwelling on revenge, experiment, haunting, wishes. While the themes are simple enough, the writing is fluid and easy to follow. What I found there is a karmic lesson, not just the "Be careful what you wish for", but also "Be careful how you treat people". In the past I've never really liked books full of short stories. Short stories were something to be read in magazines in the doctor's waiting room. Since ebooks came along I'm hooked. Having a quick read on hand for a wait or a journey is great. The stories here range in style but all have untimely death as their basis. Revenge, curiosity, come-uppance, amongst some of the topics, all dealt out with believable panache. What a way to start the day on the way to work! But don't read them as you sn In the past I've never really liked books full of short stories. Short stories were something to be read in magazines in the doctor's waiting room. Since ebooks came along I'm hooked. A haunting, gruesome, good read! I really enjoyed this book, and because it is small, it only took me a few hours to read. It is an anthology of short stories that explore themes of domestic abuse, murder, psychopathic tendencies, and good old-fashioned ghost stories. My favourites were 'A Dollar’s Worth' and 'Reunion'. I also quite enjoyed 'Bloodwork', although that did disturb me quite a bit! If you enjoy classic horror then I recommend you read this book, and it is certainly a great addition t A haunting, gruesome, good read! Yummy. It's deliciously satisfying to see Ms. Pireel use her imagination and serve up some juicy stories, just in time for those of us hungry for a tasty treat at Halloween. You're gonna want to get this book. Lucy is an avid reader and writer. She doesn't limit herself to any one genre but tries to read them all. "For one might be surprised if one tries something new" is one of her philosophies. When she's not reading or writing, you can find her outside on a long walk, or twisted into a pretzel in some yoga pose. She loves people and interacting with readers and other writers and can be found on Google+ Lucy is an avid reader and writer. She doesn't limit herself to any one genre but tries to read them all. "For one might be surprised if one tries something new" is one of her philosophies.